Safety: what about propane systems? Propane gas is one of the safest fuels. Contrary to popular belief, propane is less likely to explode than gasoline and has a much higher burning point than gasoline. The temperature must reach at least 493º Celsius for propane to ignite while gasoline catches fire when it reaches 257º Celsius. A leak can only ignite if it is subjected to intense heat, which is extremely rare. Filling your propane tank is the same as filling your gas tank. The pumps are 24/7 card lock accessible and are designed to prevent overflows and propane fumes. Modern propane supply systems are protected by pressure regulators and safety valves that virtually eliminate the possibility of excessive pressure or leaks. Not only do auto propane tanks meet Transport Canada standards, but they are also 20 times more impact resistant than gasoline tanks. Trucks and cars converted to propane are as, if not safer than conventional gasoline-powered combustion vehicles! The use of a propane vehicle on Québec public roads is not subject to any restrictions on passage through tunnels, ferries or underground parking lots. You can, therefore, drive anywhere in the province without having to worry. 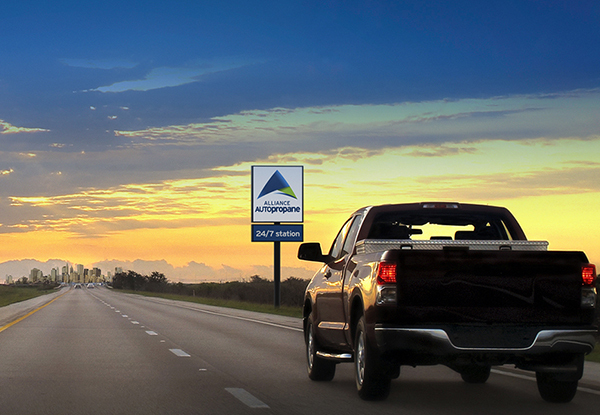 Also, Alliance AutoPropane is the largest autogas network in Quebec. Thanks to our many points of service throughout the province, you will never be caught off guard. Quebec regulations require training to learn how to fill a converted vehicle tank. The short 2-hour training is available at Alliance AutoPropane and includes a theoretical part on safety and the product and a practical part at the pump. Don’t hesitate any longer and contact Alliance AutoPropane now to convert your vehicle to hybrid propane or to get your access card!